“I had my facial and hair cut there every 5-6 weeks. I love it every time I come there. Vula always makes my face feel so good afterward. I wished I could have my facial done weekly! I feel so relax during and after the facial every time I come. I always love the way Kim cut my hair. I have been getting so many compliments about it. I have thin and fine hair. However, the way Kim cuts my hair, it always looks full and thick. I love this salon so much and strongly recommend it to everybody!” – Trang T.
“I had a cut/color appointment with Sid on Saturday; it was my first hair appointment since moving home from Charlotte, NC last month. My stylist in Charlotte wrote down my color formula and I gave it to Sid with hopes that she’d be able to somewhat duplicate the color. Not only did she duplicate, she PERFECTED the color! It’s even better than I’m used to!! And, the cut is EXACTLY what I wanted! I am so happy with the results! Plus, Ginnie gave me the most fabulous complimentary hand massage while my foils were setting. What a day!!! 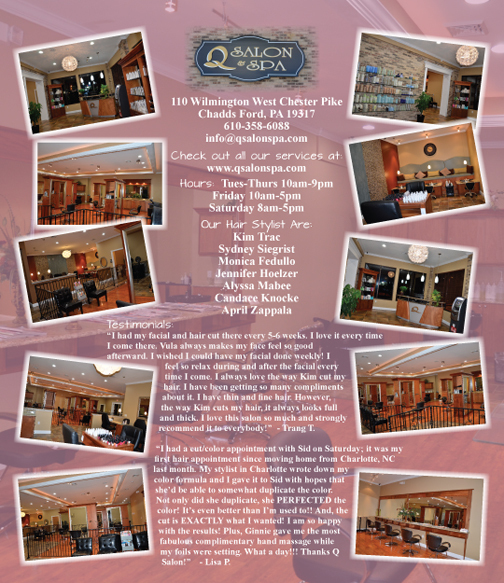 Thanks Q Salon!” – Lisa P.